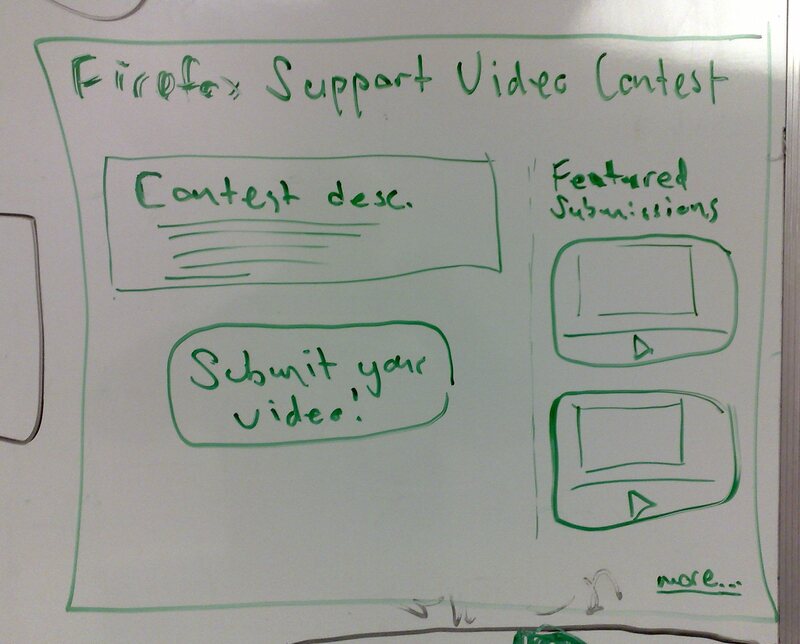 The Firefox Support Video Contest is a project aiming to make support.mozilla.com using video screencasts for the majority of the knowledge base articles. This will result in better support for our Firefox users. A nice side-effect of this project is that both the community (our potential contributors) and the end-users will become more aware of support.mozilla.com. The contest will be announced on the SUMO blog, the Mozilla blog, SFX, and personal blogs. We will also keep the attention up by continuously blogging about the status of the contest. Get at least 50 screencasts for the Knowledge Base articles. Define a quality standard for how to use screencasts in our articles. Make support.mozilla.com better known to our community and users. The contest website should have a start page, showing a description of the contest, a large "Participate" button, and, preferably, a short list of recent/featured submissions to show what we're looking for. We should start by making a few videos ourselves (meaning people at Mozilla) first and present that on the contest site as examples of what we're looking for. "This is what we made ourselves when playing around with the screencast software. You think you can do better than this?" For this contest, we will not host the videos anywhere ourselves. We will instead recommend people to either use www.jingproject.com, which is an awesome, free application to create and upload screencasts on their server, or to host the videos on e.g. YouTube or their personal servers. The page design can be kept simple by reusing the existing mozilla.com style. We basically just need a few divs and maybe one or two graphical buttons. Prizes? T-shirts, fatheads, etc. We could have different types of prizes, e.g. "Most creative video," "most informative," etc. Suggestion to give something to anyone who submits a video that ends up in the knowledge base. whole marketing team + seth + interns? We can either do it the simple way, or the cool way. Therefore, this document contains the minimum requirements as well as optional, extra requirements. A large button to participate in the contest with e.g. the text "Create your own videos!" URL/title of article the screencast is for. URL of the actual screencast. A simple list of submissions so far. Depending on legal stuff, could be linking directly to the video URL (or even embed it on the page and only show 10 videos at the time). These are things that would make the site more interactive and cool, but probably not feasible. A way to connect the list of available articles with the submissions. So, instead of just providing the name/url of the article chosen, the user would pick from a drop-down list of article, or choose "Other/None of the above". Would make it possible to see how many videos have been submitted for each article. We could use this to say e.g. "Article x has no submissions so far. By choosing an article with no other submitted videos, you increase the chance of your video getting accepted." A way to pick a "featured submission" so it automatically appears on the start page. This page was last modified on 8 April 2008, at 16:56.